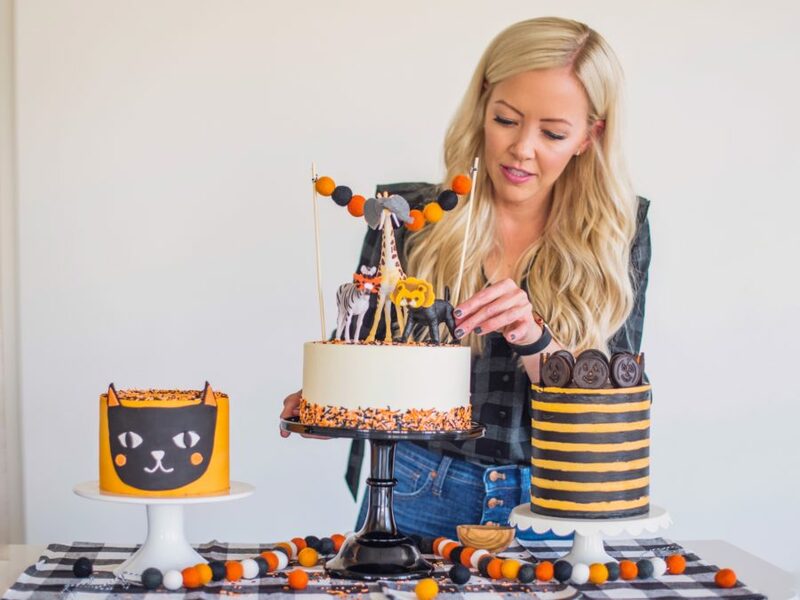 Halloween Cake Roundup – Five easy and fun Halloween cake ideas that are sure to wow your friends and family! 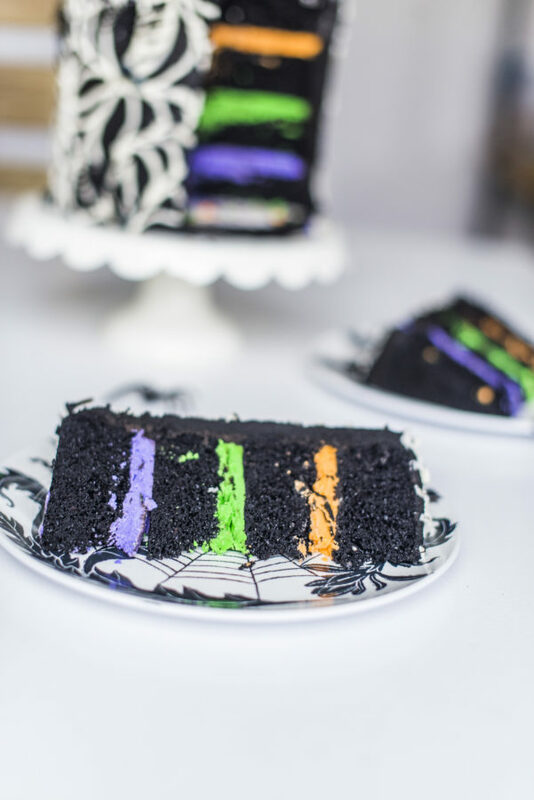 I’m so excited to share with you my new Halloween cake ideas. 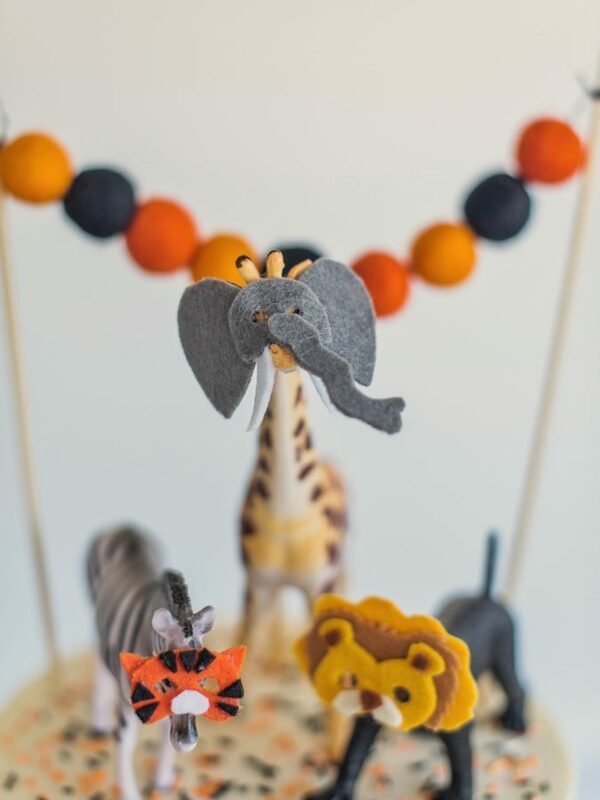 The set of cakes above were inspired by the felt ball garland from Hello Maypole. I saw the garland at Orson Gygi and then noticed the most darling picture of these animals with party hats on the Hello Maypole Instagram. Within seconds, a lightbulb went off in my head. What if I made animal masks for the toys for a Halloween inspired cake?! The next day, I ran to Target, picked up the toy animals and some felt, and got to work. I freehanded the details of the masks and used hot glue to hold them together and to put them onto each animal. It couldn’t have been more simple! Honestly! I’m not a craftsy person. I can make delicious cake, but definitely don’t see myself as someone who does a lot of DIY. If I can whip up these little masks, I guarantee you can too. After I made the masks, I then combined a couple of the Hello Maypole garland packs to create my own combination of Halloween colors. I also made my own mix of sprinkles with black, orange and light orange jimmies. The best time to add the sprinkles to the sides of your cake are while the frosting is still “wet.” In other words, right after you frost the sides, and before you freeze it again to set the cake board on top. 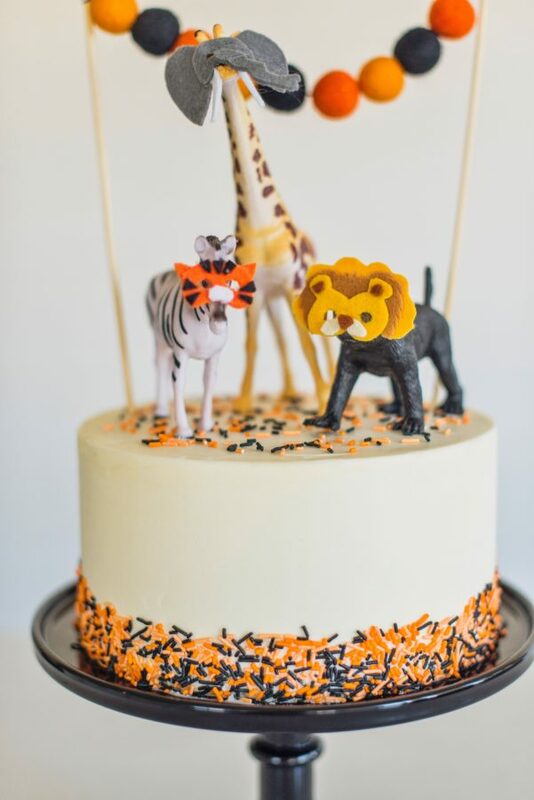 With the Halloween Party Animal Cake complete, I decided to stick with the same feel (more cutesy than gory) for my other Halloween inspired cakes. 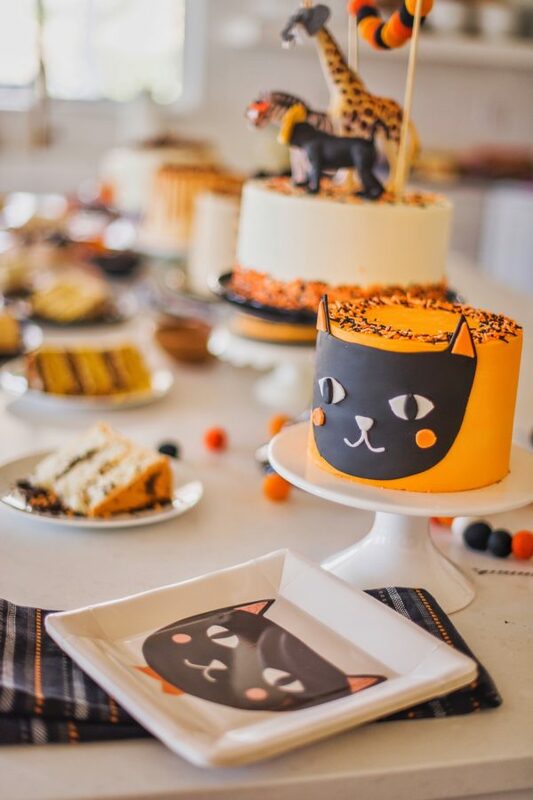 Also at Gygi, I saw these My Mind’s Eye plates and instantly knew I wanted to put this darling black cat face on a cake. 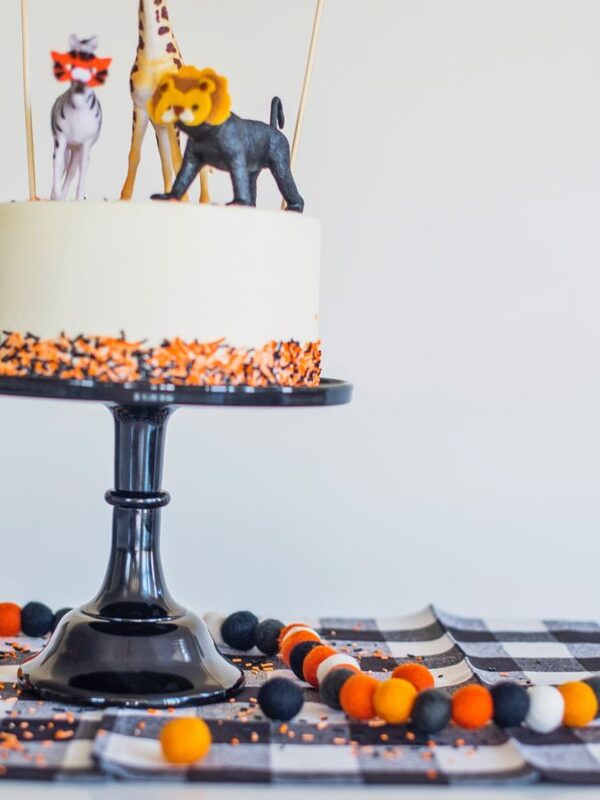 For my third Halloween cake, I wanted to keep it simple and decided to try my hand at stripes! Oh man, these stripes were a bit trickier than I expected. My problem may have been that I chose to use black frosting with a light orange. I’ll be sharing more tips for getting this look tomorrow in my Tip Tuesday, but just know, it’s probably wise to go with colors that don’t have so much of a contrast. I wish I would have done a much darker orange with my black. Or maybe even white and orange or monochromatic orange. I did capture the process in a video to help demo this technique a bit more. These next two cakes are from last year, but are still some of my favorites. 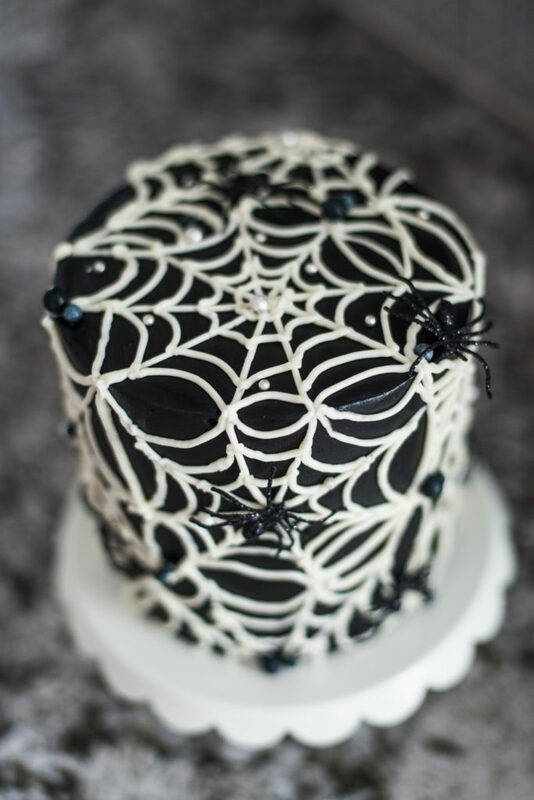 I used the same black frosting to create a base for my Spider Web Cake with black chocolate cake layers. Before I added the white buttercream spider webs, I froze the cake for about 30 minutes to set the black frosting. Here’s another video to show you how to create this look. And finally, my Bloody Handprints Cake! 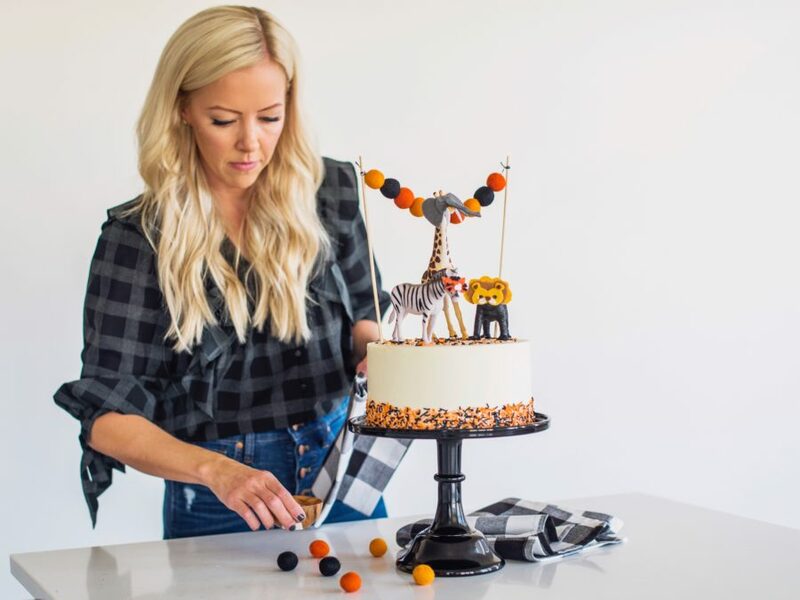 I love how easy and fun this cake was to create. For the “blood,” I used one cup of red baking chips with one-fourth cup heavy whipping cream. You’ll want to heat the cream first and then pour it over the chips and stir. Don’t try to heat the chips and the cream at the same time in the microwave. The chocolate actually starts to harden! 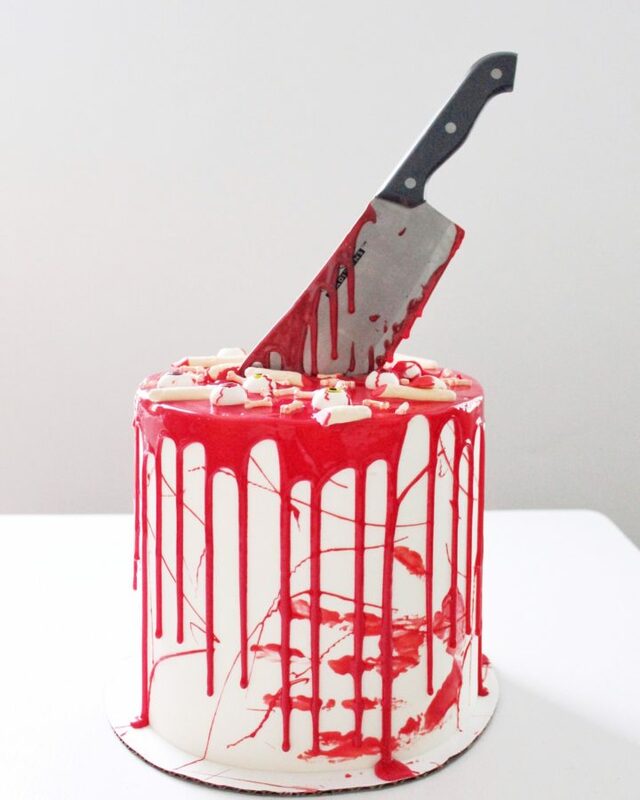 I then used a paint brush to splatter the red drip onto the cake, and then painted my hands and placed my hands right onto the frozen cake. Hi Courtney! 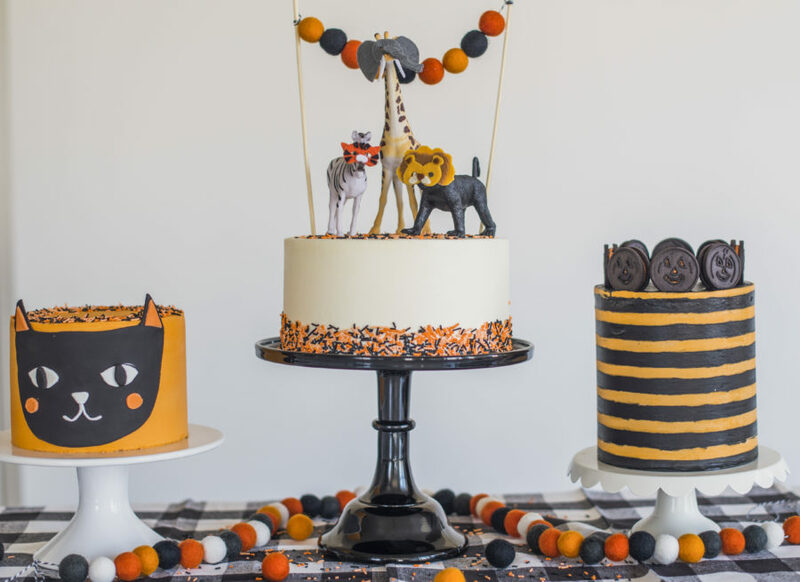 I love your cakes and really appreciate the creativity and helpful tips! Any chance you wouldn’t mind linking the comb you use to get those stripes? I haven’t been able to find one that thick. Thank you! I don’t love the one I used (it’s by Sweet Tooth Fairy), but I linked another one in the post above. Hope it helps! I do follow some forum and other bloggers who are passionate about cooking or baking, many do share the whole recipe as you do, but I am completely amazed or impress with the cleanliness of the cake, the decorated outcome was so clean, keep up doing great work.